The Family Owen: Snow, Snow, and some more Snow! As most of you well know. We have gotten some serious snow around here lately. We woke up to a major dumping yesterday! I thought I would share a few pictures. The above picture is the wreath I have hanging on our door. 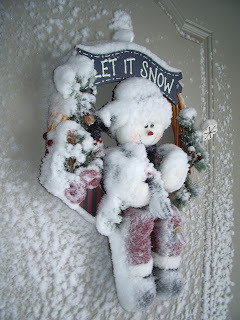 I know its a bit Christmasy, but a snowman and "Let it Snow" are definitely things that still fit in around here these days! As you can tell, he got covered in blowing snow. For those of you who have seen my house, you know that the snow was blowing around a lot to accomplish that! I tried to take lots of fun shots but not all of them turned out well enough to display how much snow there really was, but there is definitely a lot of white!! 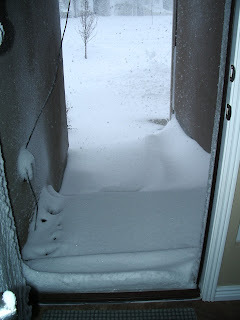 This is the view when you opened our front door yesterday morning. 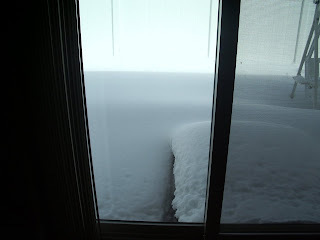 The wind blew the snow around so much that is saw several inches high against the door and a couple of feet high on the stairs. And for those of you who don't know, our porch is covered. This is the view out our back door. The snow on our steps comes all the way up past the edge of the floor and the snow is almost as deep as the top of those steps all the way around. It is insanity! Beth wants to go out and play in the snow but I am afraid she would get lost in it. It is snowing again right now. Little tiny flakes, but snowing none the less! I'd say we are pretty set for water this year. We just got home tonight and man i can 't believe all the snow. Great pictures, there sure is a lot! !